Many previously unseen photos of WW2 Cromwells and Centaurs in Action. 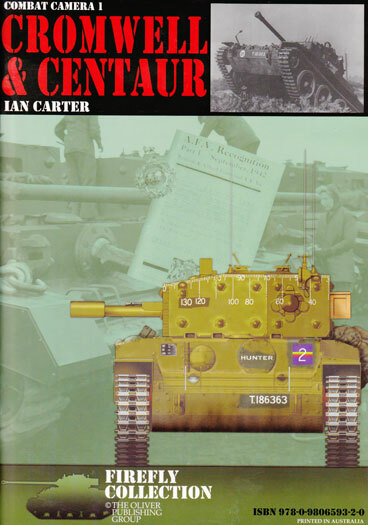 This book, the first in the Combat Camera series is dedicated to the Cromwell and Centaur in British Service. Whilst only 33 pages long it departs from the previous format and only offers the one colour plate covering 6 vehicles. It is in the main a collection of photos assembled by Ian Carter of the IWM and it is a great collection with the majority appearing in print for the first time. The Author has gone to great lengths to get the units and formations correctly identified in the captions which will be appreciated by modellers. Once again the pictures are in the main clear and a larger format allowing a high level of detail to be seen. The pictures are from the Imperial War Museum Collection and reference numbers are given should you wish to acquire copies. Additional to the photos are two pages of organisational charts and Unit insignia and Arm of Service (AoS) markings for 1944-45. Both of these Charts are in black and white and I have to say I am disappointed that the Insignia/AoS chart is in Black and White. There is a lot of good information in that chart and as they say a picture is worth a thousand words. In this case it would have been easier to explain with colour rather than describing the images. This is particularly apparent when you look at the complicated insignia for the Royal marine Armoured Support Group Markings. Following this is a page with two Organisational Charts covering a typical Armoured Brigade and the Royal Marine Armoured Support Group June 44. 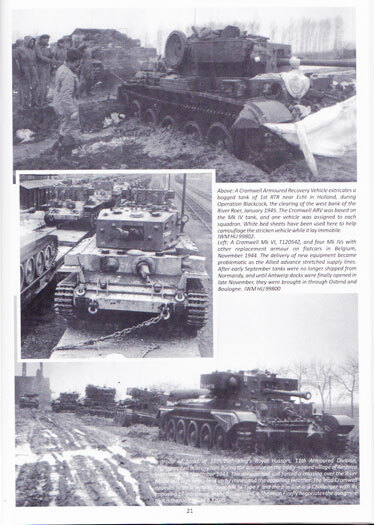 A standout feature of this book are the captions which are quite involved and offer a lot of information other than the usual description of what the vehicle is and what the unit is. Polish and Czech Vehicles are also covered in the book and again most of the pictures are new in print. If I had to find fault in this title it is the previously mentioned B&W Insignia plate and I came away feeling that the book was crammed. I felt given the amount of information on this subject that it may have been better covered in two volumes where more could have been made of the interesting variants, the debate about the Royal Marine Armoured Support Group colours and such oddities as the British rubber version of Zimmerit anti magnetic Mine Paste seen on some 7th Armoured Div Cromwell’s in France. Additional Colour plates would have been welcome also with 1 page well below the usual 4-8 we have come to expect from this publisher’s books. This is not a criticism (excluding the B&W and single colour plate) but merely an observation. In conclusion, I heartily recommend this title to modellers in particular but also to those with an interest in British Armour of WW2. It is well worth the price for the collection of new photos.